TheThe Type 92 Heavy Armoured Car (九二式重装甲車 Kyū-ni-shiki Jyū-sōkōsha), also known as the Type 92 cavalry tank, was the Empire of Japan's first indigenous tankette. Designed for use by the cavalry of the Imperial Japanese Army by Ishikawajima Motorcar Manufacturing Company (currently Isuzu Motors), the Type 92 was designed for scouting and infantry support. Although actually a light tank, it was called sōkōsha (armored car) in Japanese due to political sectionalism within the Japanese Army (tanks were controlled by the infantry, whereas the new weapon was intended for the cavalry). Exactly the same device was used in America with the M1 Combat Car. The Type 92 tankette was deployed primarily with the Kwantung Army in Manchuria and with the Chosen Army in Korea. Notable actions in which the Type 92 participated included the Battle of Harbin with the 1st Cavalry Brigade and the Battle of Rehe with the 1st Special Tank Company of the 8th Division. It is nice to see some interesting Japanese military equipment done in this scale. 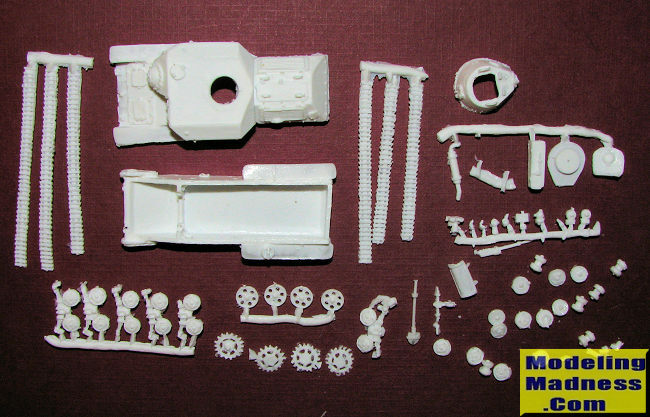 The Croco kit is cast in a white resin, and while it is difficult to tell in the image, the quality of the casting is actually very good. I saw no indications of air bubbles or other casting glitches when inspecting the parts. The upper and lower hull are separate pieces with a turret that has a lower section and a hatch. Road wheels, sprockets, return rollers and idler are all well cast. Some bits have small pour stubs on them and it would be wise to inspect all the parts to see how much, if any clean-up will be needed. Bits that add to the hull are pioneer tools, exhaust and exhaust shield. Lights and tow hooks are other bits that I was able to identify in the parts. The kit also comes with resin tracks. These are simply straight sections that I assume will need a bit of heat to conform around the curves. Instructions are minimal. There is a parts layout which has all the pieces numbered. Below that are three photos with lines going from part numbers to areas on the kit where the bits should be attached. The images have heavy shadows on one side, which makes identifying where parts on the dark side difficult at best. There are no decals and no painting information. I recommend using the reference as a good place to research this and other information. It seems like many of these tankettes did have writing on them of some sort. You have probably surmised that this is a kit for the more experienced modeler. While I am sure that someone fairly new to short run resin armor kits could build it, the very small parts as well as minimal instructions puts this into the 'experienced' category. I'm quite pleased to see things like this being produced. The quality of the molding is good and with some careful building, it should turn into a very neat little model. Thanks to Croco for the preview kit. Contact them at sniff23@inbox.lv for information and costs.